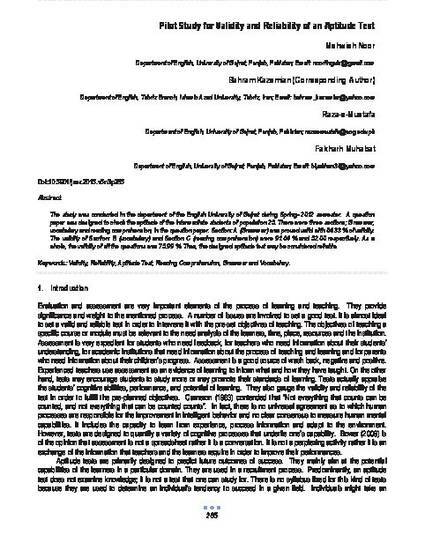 The study was conducted in the department of the English University of Gujrat during Spring- 2012 semester. A question paper was designed to check the aptitude of the intermediate students of population 25. There were three sections; Grammar, vocabulary and reading comprehension, in the question paper. Section: A (Grammar) was proved valid with 84.33 % of validity. The validity of Section: B (vocabulary) and Section C (reading comprehension) were 91.64 % and 52.00 respectively. As a whole, the validity of all the questions was 75.99 %. Thus, the designed aptitude test may be considered reliable.